Sugar ‘n Spice shoot days are big fun…a little stressful at times but always fun. The Saffron/Ochre team are fabulous and I am always delighted to work with them! Stephen de Kock (the boss), Ushi Goshalia (my other boss), Danny (cameraman extraordinaire), Levar DUB DUB (he makes divine cocktails) and the Zaheera Mohammed/Gavin Poonjala (the money master minds)…what more could a girl ask for??? 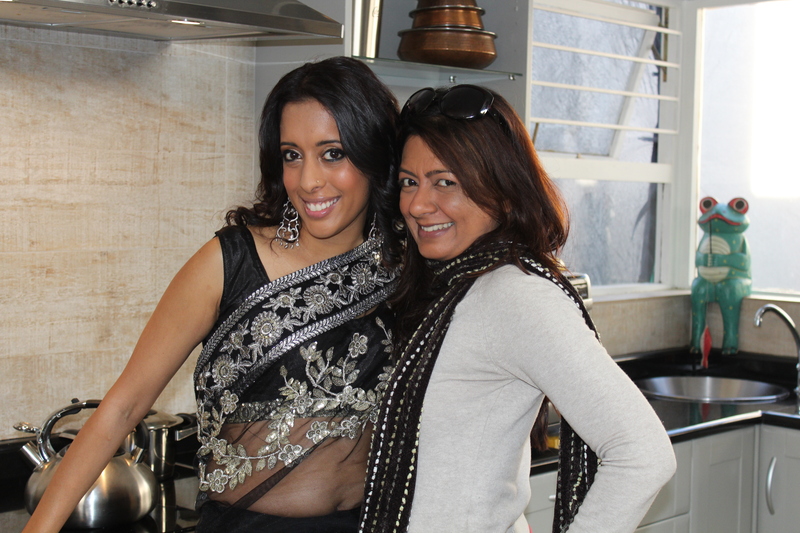 Oh yes, one more thing…Alexa Wilson…she had me looking like Indian Barbie all day…everyday! The shoots are fun…the days are long and there are lots of festive cheer…not to mention the lunch time feasts and doggie bags – It’s all part of the Sugar ‘n Spice experience! 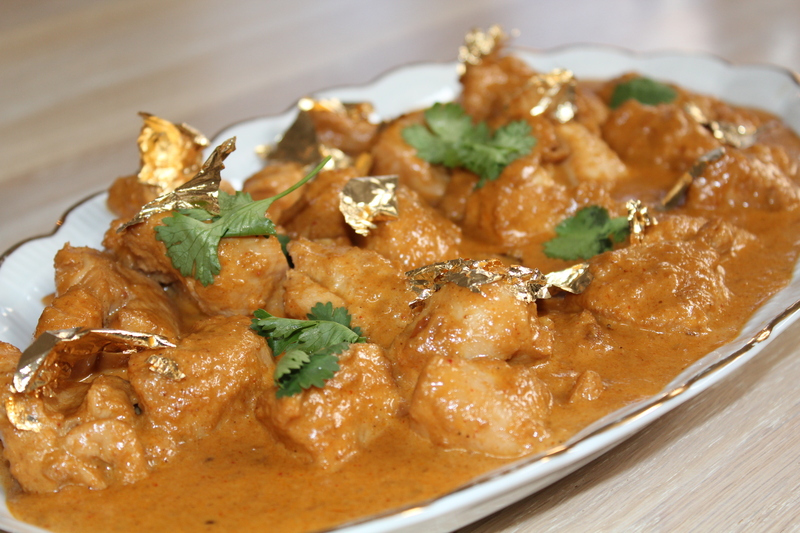 In episode five of Sugar ‘n Spice, I prepared the classic…or should I say my version of the classic Chicken Korma. 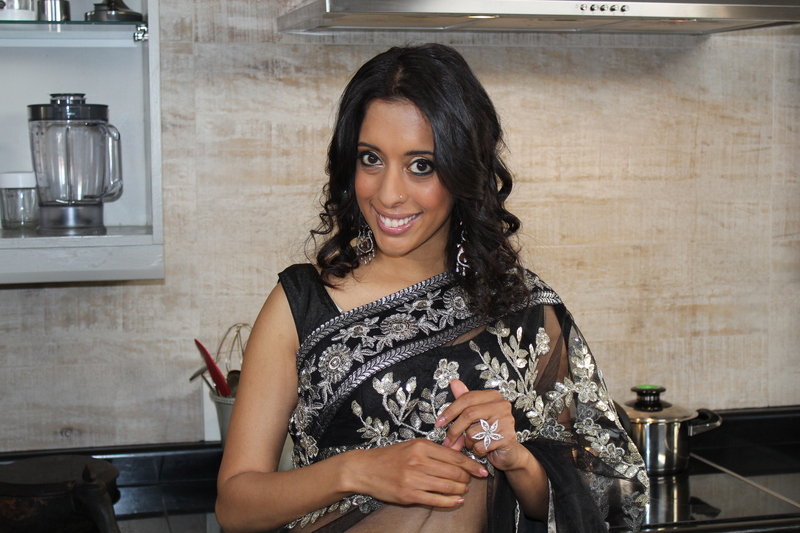 This is said to have originated in Persia and was brought to India in the 16th Century during the Mughal Empire. This is also not a dish for the faint hearted, calorie conscious eater…the sauce is lightly spiced with cardamom, red chilli, bay leaves and cinnamon, thickened with cashew nuts and finished with a generous glug of fresh cream….perfect for any feast and for those who prefer mild dishes. Soak cashew nuts in 250ml boiling water for ten minutes. Saute the onion slices with a little oil in a non stick frying pan until golden brown. Remove and drain on absorbent paper towel. Place the 60ml boiling water in a Kenwood blender with the onion slices and process until smooth. Place the onion paste in a bowl. Process the cashew nuts in the Kenwood blender with the water until smooth. Heat oil in a 30cm AMC pot on medium. Fry cinnamon stick, cardamom pods and bay leaf until they turn a shade darker and become fragrant. Add coconut and stir until the coconut turns a light golden brown. Stir in the crushed ginger and garlic. Mix in the onion paste and saute until the excess moisture evaporates. Stir in the red chilli powder, coriander and garam masala. Stir for a few seconds before adding the chicken fillets. Coat the chicken in the spices and fry until the pieces are sealed. Sprinkle in the salt. Pour in cashew paste and a little boiling water. When the chicken fillet is almost done and the cashew sauce thickens, add the fresh cream and sugar. Reduce heat and simmer for 2 – 3 minutes. Adjust the seasoning and garnish with fresh coriander leaves. Gently dab the gold leaf over the chicken and serve. Use 6 plump chicken fillets for 4 people. For a more nutty flavour, add coconut milk instead of fresh cream. A Kenwood blender/liquidiser works best when making onion and cashew nut paste – a food processor leaves lumps in the paste and does not result in a smooth sauce.